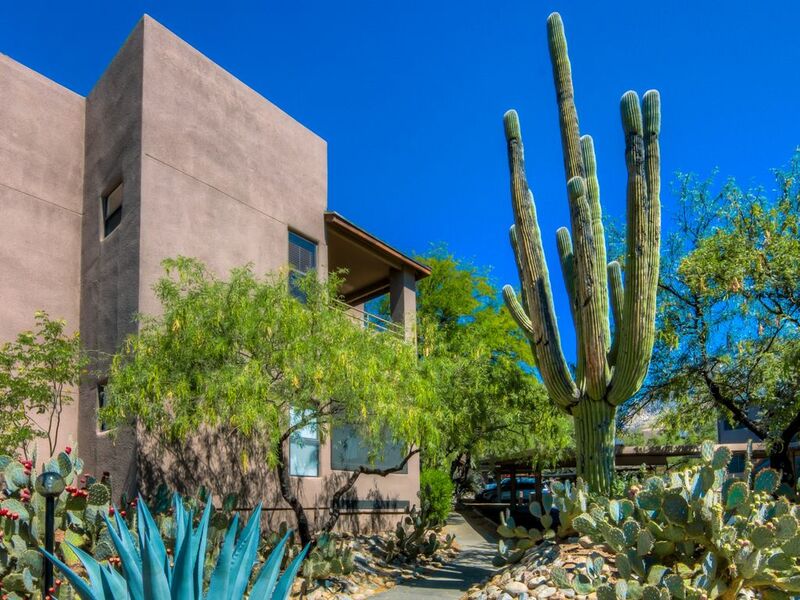 Relax in this 1,077 square foot Resort-Style, second level fully furnished Condo with a view of the dramatic Catalina Mountains and a side view of the Tucson city lights. Breathtaking sunrise over the Mountains greets you every morning. Come stay with us and enjoy the tranquility of this beautiful Sonoran Desert. Also very conveniently located close to fine dining and shopping, golf courses and mountain hiking in the Ventana Canyon trails. This condo has it all. This is a corner unit with a large and private balcony ready for those beautiful Tucson afternoons. This condo has been upgraded with Granite kitchen counter tops, Tile flooring and Tile bathroom finishes. It also has dual walk in closets, kitchen is fully equipped and has all the amenities one would expect. In the living Room you will find all the comforts from home, TV, cable, fireplace, leather sofas, as well as wifi internet access. The community offers 2 pools, 2 spas, fitness center, a clubhouse with game room and a fully equipped business center. We (my wife and I) spent the month of February at this condo and were very happy with our decision. The condo was clean, comfortable and well furnished. The parking situation was very good (this has not always been the case with rentals in the past). We enjoyed hiking in Sabino Canyon and it was nice having that area being less than ten minutes away from the condo. There was a main road outside the complex but it was lightly traveled and noise was never an issue. Basha's grocery store along with an excellent Mexican and Italian restaurant were less than three miles away. This area also included: a Shell station, a CVS Pharmacy, a Starbucks, a gelato shop along with other restaurants and shops. In driving around Tucson, we found this area to be the prettiest and not overly congested. We would definitely stay here again. Condo was very spacious, with a great view from the deck. Clean with nice appliances. Pool area very nice as well. Nice property with great views, easy walk to Ventana trailhead. Great pool and spa. More than worth the price. The condo is really nice and patio has wonderful views. We loved this condo. The location was great and at night the view of the city lights was beautiful. The owner was very thoughtful with nice touches... there were great restaurants close by and Bashas grocery store was fantastic. Everything was just perfect. condo was excellent, very clean and well kept up. Lots of supplies including water and coffee which we appreciated. The apartment was comfortable and well-equipped. The layout made it seem more spacious than the square footage would indicate as the two bedrooms and two bathrooms were separated by the kitchen/living room/dining room. The general area was nicely landscaped and well maintained. The pool and jacuzzi were also well taken of. We enjoyed our stay in Tucson and plan to return. Located on the Catalina Foothills, approximately 18 miles from the Airport, close to Sabino Canyon, Mt Lemon, La Paloma resort, and right next to 5 star Loews Ventana Canyon Resort. This area is also known for bird and wildlife watching. CANCELLATION POLICY : AT LEAST 30 DAYS ARE REQUIRED FOR CANCELLATION. NO CANCELLATIONS AND NO REFUNDS IF RESERVATION MADE WITHIN 30 DAYS.